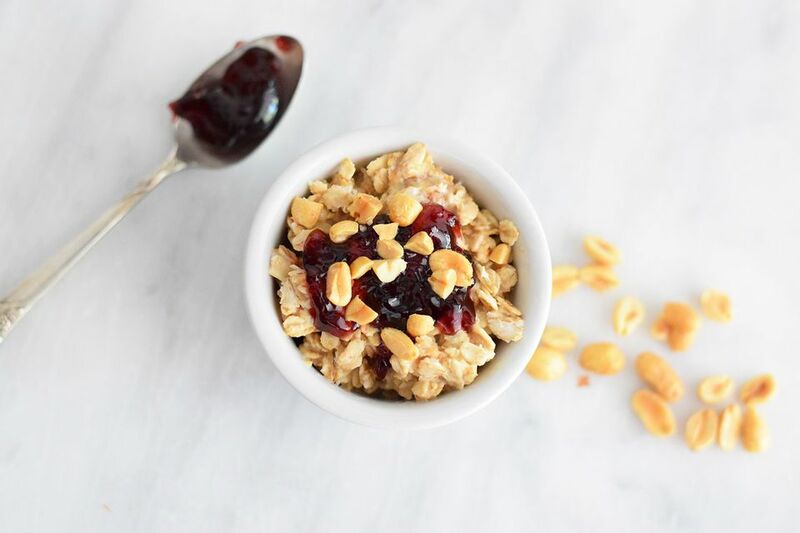 PB&J oats are the perfect combination of your favorite sandwich flavors with the best meal of the day! Like other overnight oats, there is absolutely no cooking required, which makes this recipe delicious and easy! It is perfect for winter months when you want a hearty breakfast and for summer months when the last thing you want to do is to turn on a stove or oven! Whisk together the milk, peanut butter, maple syrup, and salt in the mason jar or another airtight container. Add the ​oats to the milk mixture and stir until completely combined. Make sure to scrape the sides so that everything is incorporated. Place the lid on the container when you are done mixing! Place the container in the refrigerator for at least 5 hours and ideally overnight. It will be softened and completely ready to go in the morning. You can heat it up if you like, but it tastes delicious cold and then you avoid any cooking whatsoever! Add the jelly to the top of the oats and sprinkle with the chopped peanuts! Decide what kind of container you want to use and make it in that. It's easy to prepare, store, and serve this oatmeal recipe all in the same airtight container, such as a mason jar or plastic container. This recipe makes one single serving, but it can easily be doubled or tripled to make a larger batch. Consider making enough for a few days and separating it between easy to transport containers. You can easily take your lunch to work or school. These oats are also great for kids. They can easily serve it to themselves straight from the fridge! It can also be heated up in the microwave with ease. You can substitute maple syrup with honey or regular sugar, whatever you have on hand. Use any kind of jelly or jam that you like. Go for the traditional grape jelly or switch it up with a red raspberry preserve! Chunky or smooth peanut butter can be used. Any kind of milk can be used in this recipe too. If you do not eat dairy, simply substitute the milk with a non-dairy milk such as soy, rice, almond, or coconut milk. Just make sure to use the unsweetened variety as this recipe already has added sugar. If you only have sweetened on hand, then just lower the amount of maple syrup to one teaspoon.